Whole house music and multi-room systems are very popular in homes and living spaces of all shapes and sizes. 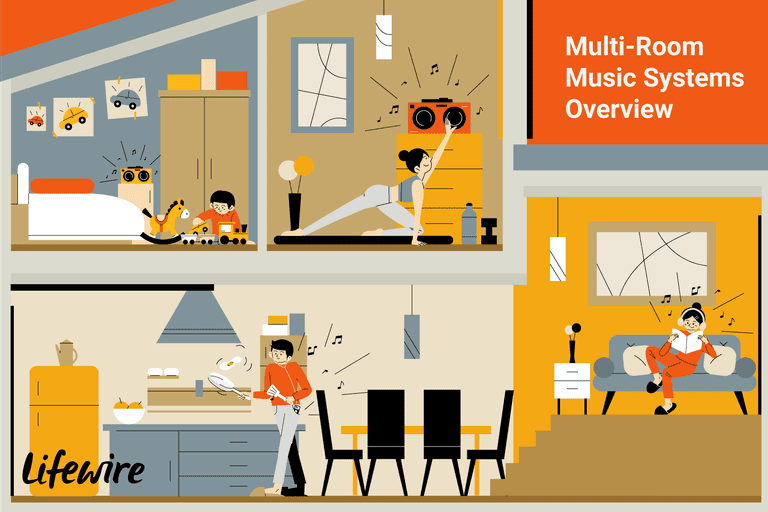 There are many ways to send music throughout a home, including wired and/or wireless connections that enable control from anywhere. You can use an existing receiver as the center hub, or you can install a completely dedicated whole house music system. The amount of effort involved can range from adding a speaker switch to a receiver, do-it-yourself wired/wireless networking, or something more sophisticated that would require professional installation. However, there are pros and cons to the different methods available. Denon AVR-S710W 7.2 Channel Full 4K Ultra HD AV Receiver with Bluetooth and WIFI. Just add speakers and run wires. Can use a separate switch for more rooms. Requires running speaker wires to other rooms. The simplest multi-room music system uses the Speaker B switch built into a stereo or home theater receiver. The Speaker B output is capable of powering an additional pair of speakers, even if they're located in another room. All you need to do is run lengths of speaker wire to connect it all together. People who might want to add more sets of speakers can do so ​with a separate speaker selector switch. And if you want easy access to volume/adjustment, control plates can be added in conjunction with the switches. Multi-source can send separate audio sources to different rooms. Independent control within each zone. Must run additional wires between rooms. May want to install IR control to adjust audio from anywhere in the house. Many home theater receivers have built-in multi-zone and multi-source features, which means each room or zone can listen to a different audio source (CD, DVD, streaming, turntable, etc.) at the same time. Some receivers have powered multi-room outputs for stereo music (and sometimes video) in as many as three zones, and some models have line level (non-powered) outputs, which require a separate stereo amp in each zone. Requires dedicated CAT-5 or CAT-6 wiring. If you own a home with computer network wiring already installed, you have a huge advantage. Running wires through existing walls is one of the most difficult and expensive parts of installing whole-house music systems. Network wiring with CAT-5e or CAT-6 cable used to interconnect a computer network can distribute line-level analog and digital audio to remote zones via multi-zone audio systems available from several manufacturers. Linksys Wi-Fi Wireless-G Broadband Router. Generally simple setup, but may require some computer networking skills and/or additional hardware. If you don't have a pre-wired home network, and if retrofit wiring is too much to consider, there is another solution: go wireless. As wireless technology has improved, so have the options for wireless audio distribution. It's a great way to enjoy your personal music library or other audio sources throughout your home. The most common wireless technology is Wi-Fi (Wireless Fidelity). No doubt you have heard the term used for wireless networking of computers. That same technology has been finding its way into multi-room audio systems. A basic media adapter made by Apple. Adapter required for each zone. Reception quality depends on distance. The simplest and most affordable way to send audio content wirelessly from one room to another is with a digital media or wireless adapter, available from a number of manufacturers. These adapters send audio signals wirelessly between two or more components, such as between a PC and a stereo receiver (or even a subwoofer), or a receiver and a tabletop system. You can enjoy wireless music almost anywhere, as long as you have a steady connection. One could also use Bluetooth to connect speakers (or even headphones) to audio sources, although it requires a few more steps to set up. But the good news is that additional adapters are relatively inexpensive and can quickly expand a system to include more rooms. No new wiring needed; uses existing electrical wires. Great choice for retrofit installations. Some systems are DIY, others require installation. AC line noise might affect radio reception, usually cured with a line filter. Some systems require installation of in-wall control keypads. Power line carrier (PLC) technology, also known by the name HomePlug, sends stereo music and control signals throughout your home via your home's existing electrical wiring. PLC products can retrofit a whole house music system without needing new wiring. Full systems and components are available or in development in a wide range of prices and features. Best choice for performance and flexibility. Built-in stereo amps for each zone. Multisource: listen to any source in any room. Require professional installation and wiring of system and speakers. Most costly option, depending on the size of the system and installation costs. Whole house music systems have a central component that sends music from selected sources (CD, turntable, radio, etc.) to each zone. It can send either line-level signals to amplifiers in each room, or have built-in amplifiers and tuners. All of these systems allow you to listen to any source in any zone and can be expanded from four to eight or more zones. Can be made to visually blend with walls or living areas. Involves more work, perhaps requiring professional installation/wiring. In-wall speakers are a great idea for whole house music systems. They offer good to excellent sound quality, don't take up any floor or shelf space like standard speakers, and can be painted to blend in with room decor and virtually disappear. However, installing in-wall speakers involves more work. Walls must be carefully cut, and wires have to run through the walls to connect to components. Depending on the difficulty of the job, the number of speakers, and your skills, installing in-wall speakers can be a do-it-yourself project or may require the services of a custom installer or electrician.